Washington, DC (October 15, 2010) - The Embassy of Argentina will have an opening reception on Monday, November 8, 6-8:30PM, for an exhibition premiering 20 photographs of Argentina's national parks by Diego Ortiz Mugica featured in the new book Parques Nacionales Argentinos (The National Parks of Argentina). Press may preview the exhibition on Saturday, November 6, 2-4PM. The exhibition, part of the celebration of Argentina's bicentennial, will be open to the public November 10-11, 1-5PM, and November 12, 1-3PM. Kaller Fine Arts (www.kallerfinearts.com) will have a large selection of Mugica's works available including images from The National Parks, Fly Fishing Moments, The Geography of the Body and other series. In the book's prologue, Argentine President Cristina Fernández de Kirchner celebrates "the extraordinary value and enormous richness of our land, our nature reserves, and our diversity." The artist's goal in the national parks project, on which he spent twelve years and traversed one third of Argentina's 36 parks, was to create "perfectly clear images where you can feel the stones, the sand, the trees and perceive the wind and the cold ... to show the natural beauty" of the parks. Among his favorite sites, the Iguazu Falls, Glaciares, and Patagonia North. Diego Ortiz Mugica, born and raised in Buenos Aires, uses photography, he says, to "share beauty with people" and his work is a way to "shout to ask people to stop and contemplate beauty." Looking and contemplation have always been important, especially as a child when a congenital heart defect kept him largely inactive for the first six years of his life. Following an operation that repaired his heart, and extensive recuperation, he developed a passion for camping. Mugica, an active photographer for more than three decades, studied for three years with Pedro uis Raota at the Escuela Superior de Arte Fotográfico (beginning in 1980), and also participated in workshops with Ulf Sjöstedt, then director of Victor Hasselblad Company magazine. Subsequently he studied large format photography with Esteban Marco, thanks to a Foundation Antorchas scholarship. In 1999 and 2001, he participated in two separate workshops with John Sexton (who worked with Ansel Adams for the last eight years of Adams' life). Mugica employs the zone system developed by Ansel Adams and Fred Archer in the late 1930s and speaks of his artistic inspirations as a trinity, with "Ansel Adams, John Sexton and Edward Weston as the Father, Son and Holy Spirit", respectively. He also cites as inspiration Richard Avedon for portraiture and Robert Mapplethorpe for the "effective" way he "took pictures of bodies and flowers." His work is in numerous public collections, among them Argentina's Museo Nacional de Bellas Artes (National Museum of Fine Arts), Banco Santa Cruz (Santa Cruz Bank), and Fundación ARCADE (ARCADE Foundation). Private collections include Argentine President Mrs. Cristina Fernández de Kirchner, Juan Cambaso, president of the art fair ARTE BA, Infanta Cristina, Duchess of Palma de Mallorca, Michael Cowdray (UK), Carole Bouquet (FR), and many others. Mugica divides his time between a house in Buenos Aires and a home Patagonia. He spends four to five months of the year at the Patagonia house, which he has owned for 15 years, and describes the environment there as "another way of living ... looking at the Limay River is like getting a massage." He would spend more time there, but in a nod to life's practicalities, he noted: "God is everywhere, but he does business in Buenos Aires." The Embassy of Argentina is located at 1660 New Hampshire Avenue, NW, Washington, DC, 20009 (corner of Q Street & New Hampshire Avenue, NW). Metro access via the Red Line, Dupont Circle stop, Q Street exit. 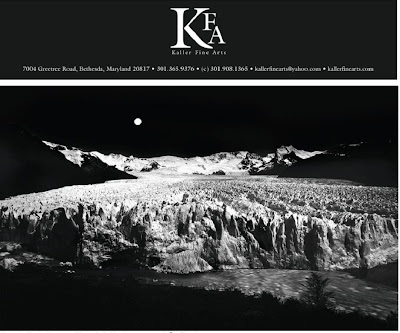 The exhibition is being held in conjunction with FotoWeek DC, November 6-13, 2010. Additional information is available at www.fotoweekdc.org. Kaller Fine Arts (http://www.kallerfinearts.com/) is a private gallery and art consulting service dedicated to providing affordable, high quality artwork to individuals and businesses. Candace Kaller brings to KFA over ten years of experience as a museum educator at the National Gallery of Art and the National Museum for Women in the Arts, as well as prior ownership of the Galerie de Tours in San Francisco. Kaller Fine Arts is open by appointment: mailto:candace@kallerfinearts.comor 301-365-9376.